…this may well be my last chance to insist, with any hope of a hearing, that Red Beard is an overpowering experience. I recognize that fewer people all the time go to films wishing to be overpowered. Soon I’ll have nobody to talk to…. Akira Kurosawa’s Red Beard was both a culmination of his filmmaking career and a dead-end. It was his last film to be shot in black-and-white and his last collaboration with actor Toshiro Mifune, with whom he had worked so closely in 16 films. But it was also the last of his statements about humanity – more specifically his last great positive statement. Subsequent upheavals in his personal and professional life were so devastating that Kurosawa apparently gave up hoping for a solution to the dire problems chronicled most forcefully in such films as Stray Dog (1949), Ikiru (1952), The Lower Depths (1957), and most recently at the time of Red Beard’s release, High and Low (1963) – namely, how to alleviate what George Orwell called “the offensive contrast of wealth and poverty” (2). In Red Beard, however, Kurosawa was still searching for – and sometimes finding – answers to the seemingly endemic suffering of humanity. A simple account of the story can give no indication of the effect of its telling. In 19th century Japan, a young doctor, Yasumoto, arrives at a free clinic to pay his respects to a friend of his father’s. Niide, whom everyone calls Red Beard, runs the clinic, and he coolly informs Yasumoto that he has been sent to replace another doctor who is leaving the clinic, and he is to begin his work immediately. Yasumoto is at first astonished, then terrified by the news, and tries to escape without ever quite succeeding. So strange and overwhelming are the problems he encounters among the clinic’s many patients – and so fascinating is the character of Red Beard – that Yasumoto finds himself somehow unable to leave. 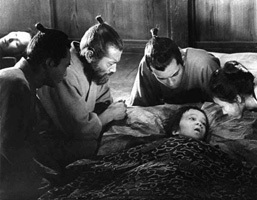 Kurosawa’s strategy for the film is similar to that used in The Lower Depths – concentrating on the reactions of a few individuals to a tableau of numerous minor characters, each one propelling the story forward by adding another layer to the veristic details, and greater depth to the film’s theme. If it is less kinetic than most other Kurosawa films (even in its few outdoor scenes, the film’s frame is largely enclosed to include only the principal players), Red Beard is all the more engrossing for its concentration on character and emotion. Kurosawa establishes a setting in which human suffering is most concentrated – a clinic for the poor – and draws the spectator, like Yasumoto, into the grime of their lives, shows us their faces, and tells us their stories of pain and unhappiness. And like Yasumoto, we are overwhelmed by it, astonished by it, repelled by it, but unable to turn away from it. Stephen Prince, in his book The Warrior’s Camera, sees Red Beard as “a deeply spiritualistic film”, in which “suffering is spiritualized” (3). Perhaps giving a nod to the then current Bresson-Ozu vogue, Prince goes on at some length to suggest that Yasumoto finds some karmic transformation in the film. Unable to alter the social conditions that result in the suffering he finds in the clinic, Yasumoto (at Red Beard’s behest) can only find relief – and release – in some Zen, monk-like detachment. Yet Red Beard is above (or, perhaps, beneath) such mystification. Kurosawa never seemed interested in any hereafters. The closest he ever came to one is in the demented fantasies of the squatters in Dodes’ka-Den (1970), grotesquely contrasted with the horrible world they must live – and die – in. And while he may have despaired of finding an Earthly Paradise, Kurosawa knew only too well the dimensions of Hell. The film he made before Red Beard was called High and Low in the West, but Heaven and Hell (Tengoku to Jigoku) in Japan – the two poles being the rich and the poor. Kurosawa showed how the two worlds barely touch, until a corporate boss must descend from the serene heights of his luxurious home to find the criminal who mistakenly kidnapped his chauffeur’s son. When Kurosawa explores individual responsibility, it is never simply a matter of personal delicacy. The aim of Watanabe’s last deed in Ikiru is the redemption of a small part of the physical world he lives in, not his own soul. The film has its shortcomings, to be sure. There are moments when an overwhelming sentiment verges precariously close to sentimentality. The film’s music, for example, is unsubtle and gets a little soupy at times. This is a charge levelled at many Japanese films, good and bad – one has only to recall the scene in Ichikawa’s The Burmese Harp (1956) when Japanese and American soldiers on opposite sides of a battlefield spontaneously join in singing “There’s No Place Like Home”. And even Niide admits he has gone a little too far when Kurosawa has him resort to a savage (and hilarious) judo display while rescuing a 12-year-old girl from a brothel. But if he was occasionally guilty of laying it on a little thick, “Kurosawa’s art”, as Vernon Young states, “is principally the sum of his conviction”. Red Beard stands as Kurosawa’s most powerful testament to the challenge that his brother Heigo set for him. In an oft-related anecdote, Kurosawa accompanied his brother through the ruins of Tokyo after the great Kanto earthquake of 1923. Turning away from the sight of the dead and dying victims of the quake, Heigo told his younger brother, “If you shut your eyes to a frightening sight, you end up being frightened. If you look at everything straight on, there is nothing to be afraid of.” (6) In his greatest films, Kurosawa exhorts us all to do the same. Vernon Young, “International Film: Tensions and Pretensions”, On Film: Unpopular Essays on a Popular Art, Quadrangle/The New York Times Book Co., New York, 1972, p. 302 (originally published in 1967 in The Hudson Review). George Orwell, The Penguin Essays of George Orwell, Harmondsworth, Penguin Books, 1984, p. 188. Stephen Prince, The Warrior’s Camera: The Cinema of Akira Kurosawa, Princeton University Press, Princeton, 1991, p. 235. Quoted in Prince, p. 247. Akira Kurosawa, Something Like an Autobiography, trans. Audie Bock, Alfred A. Knopf, New York, 1982, p. 54.